Turn-of-the-century American Lighting design and craftsmanship is available today from the Mica Lamp Co. We follow the same formula as the original craftsman. All of our parts are made of solid copper, assembled with hand driven copper rivets and finished with a rich natural patina. Our Mica shade panels are the same natural materials used by the Arts and Crafts master lamp makers. 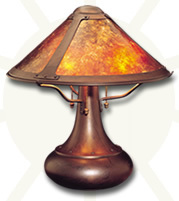 Mica Lamps are available only through our network of Authorized Dealers.